The information presented on this page was originally released on March 25, 2013. It may not be outdated, but please search our site for more current information. If you plan to quote or reference this information in a publication, please check with the Extension specialist or author before proceeding. Mississippi has many flowering native trees, and one that gets its fair share of attention this time of year is the redbud. These trees flower early in the spring before most other trees have started to leaf out after their winter naps. Although most flowering trees native to Mississippi tend to be understory trees that can be hidden by bigger trees and their foliage, it’s common around the state to see a redbud framed or silhouetted by leafless hardwoods. Redbud is a readily adaptable species that can tolerate many different soil and climatic conditions. Redbuds are rare in the coastal counties where they most often are planted as part of an ornamental landscape. They are more common north of a line drawn through Hattiesburg. Travelling north, you can first find redbuds growing in the swales around creeks, and then later they become more common on flatter land. Redbud flowers are gorgeous in the spring. Colors range from light, clear pink to purplish pink, and there are several white-flowered selections available at nurseries. Flowers are grouped in clusters held tightly against the stems and branches, creating colorful outlines of the branching structure of the tree. The individual flowers closely resemble pea flowers. This isn’t too surprising as redbud is a member of the legume family and the trees produce flat, brown seedpods. 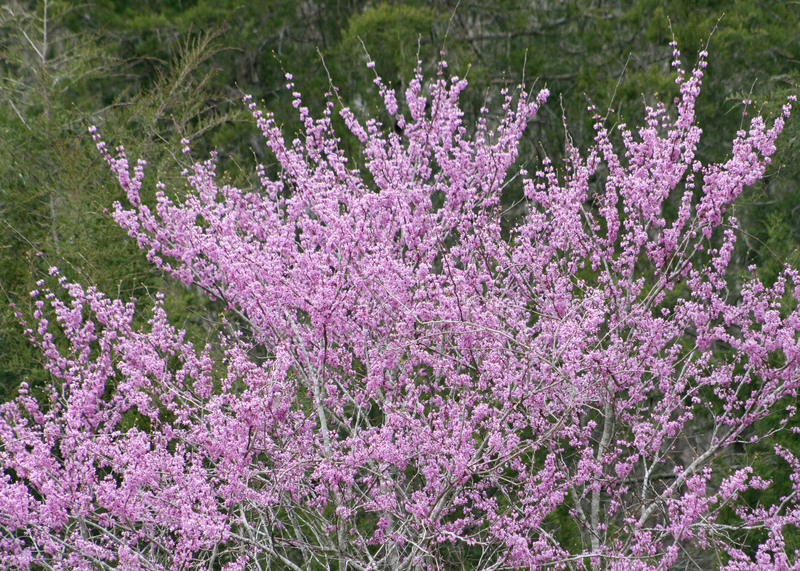 Under optimal conditions, redbud is considered a small tree capable of reaching 15 to 30 feet tall. It typically has a short trunk and a rounded, almost umbrella-like crown. Foliage emerges after the flowering is finished, almost as if the leaves do not want to interfere with the pink show. Leaves are glossy green in the summer and heart-shaped, reaching 3 to 5 inches across. Unfortunately, there is little potential for fall color, although some yellow-colored leaves may appear in the fall sometimes. For best growth, place redbuds as understory trees. Planting sites with partial to full shade are probably best, but I’ve seen several splendid specimens being grown out in the full sun. Some selections have maroon-colored leaves that are pretty close to Bulldog maroon. One of the best selections I would pick for the landscape is Forest Pansy. 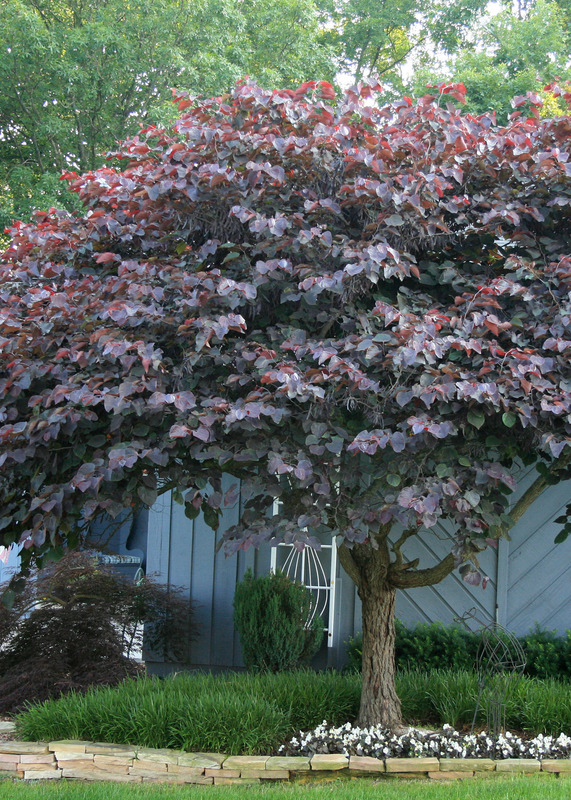 This redbud’s heart-shaped, purple-maroon foliage has outstanding color when it receives morning sun. This question had me scratching my head a little bit until I was reminded that many plant names derive from descriptions of the plant. Botanical Latin describes color (alba means white) or leaf shape (macrophylla means large leaf). Common names, while not as exact, tend to be easy to understand without having to translate. 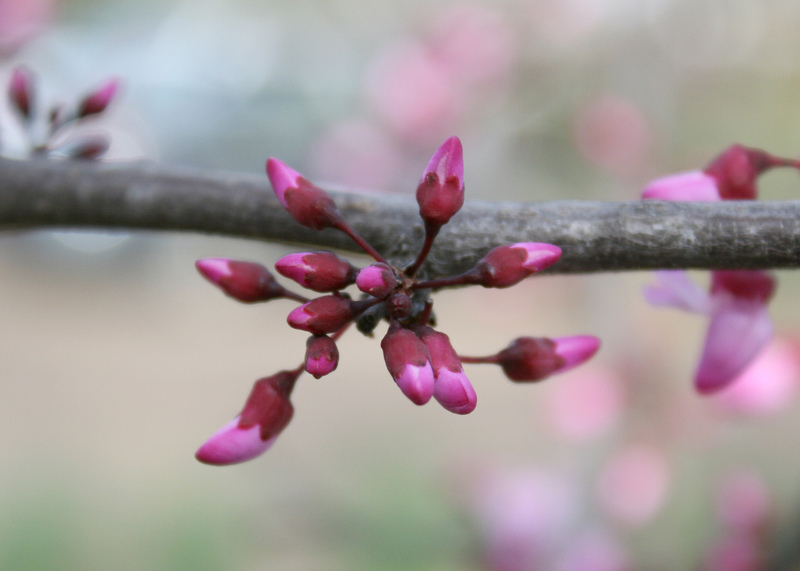 It became readily apparent to me where the redbud’s name came from as I looked at flowers buds beginning to open. The outer layer of bud scales protecting the developing flower is a deep, red color. Redbud is a good choice for adding a punch of spring color to your landscape as a specimen or in a shrub border.